I'm 14 and just started, I keep my auto-darkening helmet to go to around shade 10 in dark-state and I don't know what I'm doing wrong to not be able to see the weld puddle that is 'present' during welding. I know that you have to lead/push the puddle but I can't see the puddle. What do I do? you are going to have to figure out where to position your head to get line of sight on the puddle. 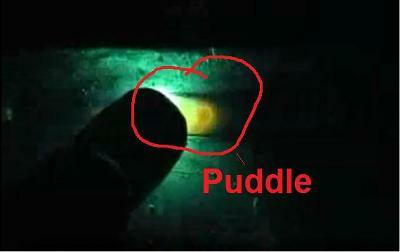 when you pull, you can see the puddle, but its hard to see where you are going because the nozzle blocks your view. it is what it is.....your job is to find a way to see the puddle well enough and where you are going. thanks for the post and the image. Darken your helmet. I also started @ 10, but have actually found 12 preferable. Hopefully you have a large screen, they help. Finally- position is everything. Get comfy, bend @ knees, straight back, to the left your work, remembering it's 80:20...... 80% of focus on what's behind you, and 20% focus on what's in front. Get in close, take your time, you should see it flow behind the stick, pool slightly and lose colour, then move on. Hope this has helped somewhat. looks like you are pulling towards you from right to left and the nuzzle dont let you see the puddle try to pull away from you and put your hood in front of the nuzzle.